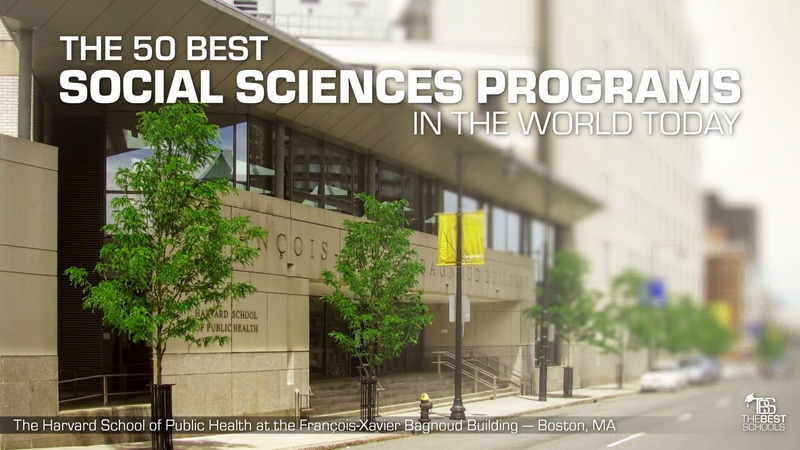 The 50 Best Social Sciences Programs in the World Today! Humans are interesting. In fact, they're the most interesting thing in the universe. Of course, there's some bias in any such claim: it's after all humans who are claiming that humans are interesting. Still, humans make a fascinating object of study. We are bundles of contradictions. We reach incredible heights of attainment and aspiration, but we also fall into depths of viciousness and foolishness. Opposites like good and evil, smart and stupid, and erratic and predictable only begin to describe the human condition. People are wildly diverse, and that makes studying them an exciting challenge. Schools of Social Science attempt to rise to that challenge, including both top down approaches from Sociology, and bottom up ones from Psychology. They incorporate lessons learned from Economics, number crunching demographics, historical studies from Anthropology and Archeology, and biological lessons from Anatomy and Ecology. The Social Sciences have become increasingly interdisciplinary. As disciplines keep crossing boundaries and creating synergies among previously disparate areas of study, the number of departments associated with the Social Sciences keeps increasing. Business and Economics, for instance, have impacted Psychology through behavioral economics. Neuroscience and Evolutionary Psychology now play a significant role in the sociological study of religion. And of course, researchers in the Social Sciences are constantly developing new and more powerful ways to identify, analyze, and interpret new data. The Roman playwright Terence (195 -- 159 BC) enthused that "nothing human is alien to me" (humani nihil a me alienum). That about sums up the Social Sciences. It encompasses everything human. This accounts for the Social Sciences' massive web of interconnections among disciplines. But it also means that any ranking of such programs faces considerable challenges. Students who study the Social Sciences need to go deep and specialize in a given discipline (such as Psychology). At the same time, they need the support that comes from other disciplines and departments that bear on their focus of study. As a consequence, students looking for the very best programs in the Social Sciences must also pay attention to the overall reputation of the school they are considering. For this ranking, it was therefore necessary to maintain the right balance of disciplinary and cross-disciplinary excellence. Accordingly, we looked to the Center for World-Class Universities operated by Shanghai Jiao Tong University (right). This center specializes in ranking universities as well as their individual programs of study. International in scope and focused on academic performance, these are known as the "Shanghai Rankings." From the Shanghai Rankings, we therefore identified the 50 best programs in the latest 2015 Academic Ranking of World Universities in Social Science. Taking this Shanghai Ranking as our point of departure, we researched the most important characteristics of each of the top 50 social science programs on the list in order to reveal why each university's program appears where it does. Harvard University ranks #1 on The 50 Best Social Science Programs! Harvard University operates the School of Public Health where students will find the Department of Social and Behavioral Sciences. There are 20 primary faculty members with the roles of teaching and researching the most current social issues. The three main research areas are Social Determinants, Intervention/Communication, and Maternal and Child Health. Research is conducted in a number of cutting-edge facilities including the Center on the Developing Child, the Center for Global Tobacco Control, the Center for Population and Development Studies, the College Alcohol Study, the Health Literacy Studies, the Prevention Research Center, and the Public Health Disparities Geocoding Project. Students interested in this program have a number of concentrations to choose from: Health Communications, Women/Gender and Health, Maternal and Child Health, Obesity Prevention, Public Health Leadership, and Nutrition and Global Health. Students interested in Doctoral studies at Harvard can apply to the PhD in Population Health Sciences and select the Social and Behavioral Sciences field of study. University of Chicago ranks #2 on The 50 Best Social Science Programs! Within the Division of Social Sciences at the University of Chicago are the Schools of Economics, Sociology, and Political Science. Within these schools there are nine Ph.D. programs and four Master's programs for students to choose from. The academic departments include: Anthropology, Comparative Human Development, Economics, History, Political Science, Psychology, Social Thought, and Sociology. There are 16 research centers connected to the various departments including the Center for the Study of Gender and Sexuality, the Katz Center for Mexican Studies, the Center for International Studies, the Center for Early Childhood Research, the Population Research Center, and the Spatial Intelligence and Learning Center. The three research institutes available are the Becker Friedman Institute, the Institute for Mind and Body, and the Neubauer Collegium for Culture and Society. An additional 15 centers are connected to the University's Division of Social Sciences through association and include the Center for Jewish Studies, the Brain Research Imaging Center, and the MacLean Center for Clinical Medical Ethics. Massachusetts Institute of Technology (MIT) ranks #3 on The 50 Best Social Science Programs! Well known for its advancement of technology and science, the Massachusetts Institute of Technology has maintained a very practical edge to its curriculum. This holds true throughout all five of MIT's school, including the School of Humanities, Arts, and Social Sciences. Established in 1950 with John Ely Burchard as the first dean, the school is associated with four Nobel Prize recipients, seven Mac Arthur Prize recipients, and four Pulitzer Prize recipients. There are 10 major academic divisions within the school such as Comparative Media Studies, Literature, Political Science, and Linguistics. Cutting edge facilities include the Center for International Studies, the Knight Science Journalism Program, and the Poverty Action Lab. Graduate students have a plethora of research topics to choose from, some of the more recent inquires have included ‘How was the U.S. Constitution adopted? ', ‘Can computers learn music theory? ', and ‘Is a basic moral sense hard-wired?'. Columbia University ranks #4 on The 50 Best Social Science Programs! As the oldest college in the state of New York, Columbia University has established itself as a private Ivy League research University with something to offer every one of the nearly 30,000 enrolled students. The Division of Social Science falls under the jurisdiction of the Faculty of Arts and Sciences. The Division itself includes five departments: Anthropology, Economics, History, Political Science, and Sociology. The departments are able to maintain over 25 research centers and institutes. Some of those include the Center on Capitalism and Society, the Center for International History, the Center for Jazz Studies, the Columbia European Institute, the Institute for Religion, Culture, and Public Life, and the South Asia Institute. In addition to degree programs and research centers, the Division of Social Science also runs the Columbia Social Science weekly News Letter. University of California, Berkeley ranks #5 on The 50 Best Social Science Programs! The College of Letters and Science is the largest of Berkeley's 14 schools and colleges with 20 percent of the faculty members and 25 percent of the student body. The faculty members of the College of Letters and Science include 15 of the 22 Nobel Prize recipients associated with Berkeley, three of the four Pulitzer Prize recipients, and 19 of the 32 Mac Arthur Prize recipients. There are five academic divisions within the College itself: Arts and Humanities, Biological Sciences, Mathematical and Physical Sciences, Social Science, and the Undergraduate Division. Within these five divisions there are 12 departments and over 80 degree tracks for students to choose from. Associated research facilities and museums include, the Center for the Study of Sexual Culture, the Field Station for the Research of Animal Behavior, the Hearst Museum of Anthropology, the Institute for Cognitive and Brain Sciences, and the Institute for Business and Economic Research. Stanford University ranks #6 on The 50 Best Social Science Programs! The School of Humanities and Sciences is both the largest and the youngest of the seven academic divisions at Stanford University, being founded in 1948. The school has three major departmental divisions, Humanities and Arts, Natural Sciences, and Social Sciences, with over 50 degree tracks to choose from. The Social Sciences department itself has a further six divisions, Communication, Economics, Political Science, Psychology, and Sociology. It is also associated with over 20 interdisciplinary programs including: African and African American Studies, Comparative Studies in Race and Ethnicity, Medieval Studies, Public Policy, Symbolic Systems, and Urban Studies. The 30 plus research centers and institutes managed by the School of Humanities and Sciences include: the Bill Lane Center for the American West, the Haas Center for Public Service, the Clayman Institute for Gender Research, the Stanford Archeology Center, and the Taube Center for Jewish Studies. Princeton University ranks #7 on The 50 Best Social Science Programs! The Graduate School at Princeton University manages the Social Sciences division which covers 10 departments including Finance, History of Science, Population Studies, and the Social Policy Joint PhD program. Their economics department in particular has produced stunning success, both through the Nobel Prize in economics and in landing former professor Ben Bernanke as Federal Reserve Chairmen, where he directed the countries finances during the financial collapse of 2008. But Princeton's success in the social sphere is not only shaped by recent accomplishments. Arguably no school in the history of the world has had a greater impact on the humanities than Princeton, for Princeton president Woodrow Wilson went on to become the U.S. President who spear headed the League of Nations, which in turn laid the groundwork for the United Nations. Thus, for the past century this school has been at the forefront of major developments and actually shaped, not just studied, the social sciences. New York University ranks #8 on The 50 Best Social Science Programs! The School of Arts and Science at New York University has a number of famous names connected to its various departments such as Samuel Morse, inventor of the telegraph and former professor; John W. Draper, inventor of modern photography; and the founding location of the American Chemical Society. There are eight major departments in the School: Anthropology, Bioethics, Economics, Environmental Studies, Journalism, Linguistics, Politics, and Sociology. The 13 centers of research include the Hamilton Center for Political Economy, the Experimental Social Sciences, the Institute for the Interdisciplinary, the Center for Religion and Media, and the Native Studies Forum. The Graduate School of Arts and Science is a separate entity, founded in 1886, and recognized as one of the oldest graduate schools in America. There are nearly 100 programs of study available in areas such as Cinema Studies, Fine Arts, Hebrew and Judaic Studies, Museum Studies, and Philosophy. There are over 4,000 students enrolled in the Graduate School. Yale University ranks #9 on The 50 Best Social Science Programs! Founded 1701, Yale University is the third oldest institution of higher learning in America. The study of Social Sciences can be traced back to the very beginning. Today there are 20 undergraduate departments and programs within the Social Sciences discipline including Anthropology, Biostatistics, Global Affairs, Law, Political Science, and Women, Gender, and Sexuality Studies. The Graduate School of Arts and Sciences was formally established in 1847. There are over 50 departments and programs available at the Master's and Doctoral level with more than 2,800 students enrolled. There are over 25 centers and institutes dedicated to research for the Arts, Humanities, and Social Sciences such as the Center for Customer Insights, the Human Relations Area Files, the Institute of Sacred Music, the Jonathan Edwards Center, the Center for Emotional Intelligence, and the Indian Papers Project. The Center for Science and Social Science Information is also available; it provides support services for social science and interdisciplinary researchers. University of Pennsylvania ranks #10 on The 50 Best Social Science Programs! Founded by inventor and entrepreneur Benjamin Franklin, the University of Pennsylvania has an unparalleled historical advantage when it comes to the Social Sciences. The School of Arts and Sciences is one of 12 academic divisions at UPenn. The School is further organized into the College of Arts and Sciences, the Graduate Division, and the College of Liberal and Professional Studies. There are 27 departments including Criminology, Earth and Environmental Studies, History of Art, Music, Political Science, and Religious Studies. Undergraduates have 64 majors to choose from, while graduate students have over 33 Master's and Doctoral tracks. Associated with the School of Arts and Sciences are over 30 research centers and programs including: the Center for Ancient Studies, the Center for Program in Contemporary Writing, the Price Lab for Digital Humanities, the Fox Leadership Program, the Center for Italian Studies, the Penn Language Center, the Middle East Center, and the Population Studies Center. University of Michigan ranks #11 on The 50 Best Social Science Programs! The University of Michigan is recognized as the state's oldest university, being founded in 1817. There are 19 schools and colleges including the College of Literature, Science, and the Arts which itself was established in 1841. There are currently over 100 programs offered through 75 departments at the College. Departments and units include American Culture, Culture and Cognition, the Greek and Roman History Program, Statistics, and Women in Science and Engineering. The Social Science unit covers 13 key areas of research including Anthropology, Cognitive Science, Economics, Organizational Studies, Psychology, Sociology, and Women's Studies. Museums affiliated with the Social Science unit and the College of Literature includes that of Anthropological Archaeology, Natural History, Paleontology, and Zoology. London School of Economics and Political Science ranks #12 on The 50 Best Social Science Programs! The London School of Economics and Political Science was founded in 1895 with a specialized focus for the Social Sciences. A total of 16 Nobel Laureates have been associated with the school, the first being George Bernard Shaw who was also one of the founding members. With 25 academic departments, the school is, as its name would suggest, well known for the study and research of economics. It has one of the largest concentrations of applied economics in the world. This includes 220 research centers such as the Centre for Economic Performance, the Grantham Research Institute on Climate Change and the Environment, the Center for Analysis of Social Exclusion, the Center for Women, Peace, and Security, and the Systemic Risk Center. LSE has also established a global network maintaining academic relationships with Columbia University in New York, Sciences Po in Paris, Peking University in Beijing, and the National University of Singapore. University of Oxford ranks #13 on The 50 Best Social Science Programs! As perhaps the oldest institution of higher learning it the world, Oxford University has a substantial history for all its departments and the Division of Social Science is no exception. There are six schools within the division: Archeology, Business, Interdisciplinary Study, Anthropology, Government, and Geography and the Environment. The various departments include Economics, Education, Politics and International Relations, Social Policy and Intervention, and Sociology. There are also two cross divisional schools: Oxford Martin School and the Oxford-Man Institute of Quantitative Finance. There are approximately 1,000 researchers dedicated to the advancement of the social sciences. Some research strengths include aid, poverty, and development, big data, conflict, justice and crime, future cities, governance, and migration and population. Research partnerships exist between Oxford University, the commercial sector, and numerous other educational institutes. Some examples of Centers of Excellence include the Center of Migration/Policy and Society, the Center for Entrepreneurship, and the Environmental Change Institute. Northwestern University ranks #14 on The 50 Best Social Science Programs! Weinberg College of Arts and Sciences, founded in 1851, is the largest and oldest of the undergraduate Schools at Northwestern University. There are 12 schools and colleges all together with 124 undergraduate degrees and 145 graduate and professional degrees. The Weinberg College has 26 departments including Art History, Classics, Religious Studies, and Statistics. There are over 4,000 undergraduate students and more than 1,000 graduate students enrolled. Undergraduate students have 36 programs to choose from including British Studies, Cognitive Science, Geography, Materials Science, Plant Biology and Conservation, and the Writing Program. Graduate students have 30 programs to select from which offer Master's, PhD, and Graduate Certificate studies. There are 20 research centers and institutes affiliated with the College including: Center for Catalysis and Surface Science, Center for Structural Biology, French Interdisciplinary Group, Institute for Policy Research, and the Paris Program in Critical Theory. University of Minnesota, Twin Cities ranks #15 on The 50 Best Social Science Programs! The University of Minnesota was founded in 1851. From humble beginnings the school has grown to 30,500 undergraduate students, 16,300 graduate and professional students, and 7,000 international students from 135 different countries. Students have a plethora of courses to select from which are organized into a total of 19 colleges and schools. One reason students seek out the University of Minnesota is for the comprehensive Division of Social Sciences. There are eight engaging disciplines within the division: Anthropology, Economics, History, Human Services, Management, Political Science, Psychology, and Sociology. There are also seven interdisciplinary majors and minors including American Indian Studies, Latin American Area Studies, Environmental Studies, and the Social Science Major. Faculty members have expertise in areas such as Culture and Identity Development, Economic Theory and Methodology, Environmental Monitoring, the U.S. trucking industry, Social Movements, Medieval History, and Maternal Behavior. University of California, Los Angeles ranks #16 on The 50 Best Social Science Programs! Founded in 1919, the University of California in Los Angeles has a diversity of undergraduate and graduate degrees, over 275 programs in total. Degrees are offered through five undergraduate colleges, seven professional schools, and four professional health science schools. The faculty members are highly qualified and experienced within their respective fields. Among the faculty, researchers, and alumni are a total of 13 Nobel Prize recipients. The Division of Social Science at UCLA manages 17 departments including Aerospace studies, Asian American studies, Conservation, Military Science, and Naval Science. There are 13 research centers and institutes under the jurisdiction of the Social Sciences which include the Center for Population Research, the Center on the Everyday Lives of Families, the Center for the Study of Urban Poverty, the Institute for Research on Labor and Employment, and the National Center for History in the Schools. The Division is also a member of the Partnership UCLA initiative. Duke University ranks #17 on The 50 Best Social Science Programs! Founded 1838, Duke University is organized into four undergraduate colleges and 10 graduate or professional schools. The Trinity College of Arts and Sciences is one of the larger colleges and awards nearly 80 percent of the undergraduate degrees. The college has four main divisions: Arts, Humanities, Natural Sciences, and Social Sciences. The Social Sciences Division manages 12 departments and programs including: Cultural Anthropology, History, International Comparative Studies, Political Science, and Women's Studies. Associated with the Social Science Division are 18 Centers and Institutes of research. Some examples include the Center for Cognitive Neuroscience, the Center for Population Health and Aging, the Center for the History of Political Economy, the Duke Human Rights Center, and the Samuel DuBois Cook Center on Social Equity. There are also six affiliated schools and institutes including the Institute for Brain Sciences, the Kenan Institute for Ethics, and the Social Science Research Institute. University of Cambridge ranks #18 on The 50 Best Social Science Programs! At Cambridge University, the School of Humanities and Social Sciences is the largest of the six schools in terms of student numbers which comprise the University. There are approximately 2700 undergraduates, and 1200 taught and 1400 research postgraduate students. The School of the Humanities and Social Sciences encompasses the following institutions: Faculties include Economics, Education, History, Human/Social and Political Science, Politics and International studies, and History and Philosophy of Science. The Faculties are sectioned into Departments and Centers including Biological Anthropology, Social Anthropology, Land Economy, the Center of Development Studies, the Center of South Asian Studies, and the Leverhulme Center for Human Evolutionary Studies. The division also works in conjunction with the Whipple Museum of the History of Science and the Museum of Archaeology and Anthropology. Carnegie Mellon University ranks #19 on The 50 Best Social Science Programs! Founded in 1900 as a technical school, Carnegie Mellon University is well known for its pioneering advancements in the fields of Technical Writing, Behavioral Economics, and Decision Sciences. The Dietrich College of Humanities and Social Sciences manages seven departments: English, History, Modern Languages, Philosophy, Psychology, Social and Decision Sciences, and Statistics. Faculty members of the College include seven members of the American Academy of Arts and Sciences, three members of the National Academy of Science, two members of the National Academy of Medicine and one member of the National Academy of Education. Research centers associated with the College include the Center for Arts in Society, the Center for Ethics and Policy, the Center for the Neural Basis of Cognition, the Dynamic Decision Making Laboratory, the Laboratory for Empirical Approaches to Philosophy, and the Pittsburg Mind-Body Center. The University of Texas at Austin ranks #20 on The 50 Best Social Science Programs! The University of Texas in Austin was founded in 1883. There are currently 18 colleges and schools, seven museums, 17 libraries, and over 100 undergraduate and 170 graduate degrees. The College of Liberal Arts can trace its origins to 1883 and the founding of the University. The College consists of 25 departments including Air Force Science, Geography and the Environment, Linguistics, Naval Science, Religious Studies, and Rhetoric and Writing. Centers and Institutes of research include the Center for Australian and New Zealand Studies, the Center for Perceptual Systems, the Center for Women's and Gender Studies, the Population Research Center, the Texas Language Center, the Institute for Israel Studies, the Institute for Urban Policy Research and Analysis, South Asia Institute, and the Teresa Lozano Long Institute for Latin American Studies. University of North Carolina ranks #21 on The 50 Best Social Science Programs! As one of the original eight public Ivy League schools, the University of North Carolina was founded in 1789. The growth of the school can be seen in the largest unit on campus, the College of Arts and Sciences. There are over 16,000 undergraduates and 2,500 graduate students enrolled in this one school. Five major academic divisions exist in the College of Arts and Sciences: Fine Arts and Humanities, Natural Sciences and Mathematics, Social Sciences, Undergraduate Education, and Global Programs. Under the Social Sciences division there are 27 departments, centers, and programs including Aerospace studies, Global studies, Peace/War and Defense, Naval Science, and Social and Economic Justice. Numerous research centers are also associated with the Social Sciences such as the African Studies Center, the Archeology Research Labs, the Center for Urban and Regional studies, and the Carolina Asia Center. Pennsylvania State University ranks #22 on The 50 Best Social Science Programs! Penn State University was founded in 1855 and is now considered a research intensive institution of higher education. The school has expanded into 24 campus locations with 18 major schools and colleges offering over 300 undergraduate and graduate degree programs. The University Park campus is the flagship location with over 46,000 students enrolled within 160 different majors. Penn State Behrend manages four schools, including the School of Humanities and Social Sciences. Programs at Behrend include 37 Bachelor's, four Associate, and five Master's degrees. Of those programs, the School of Humanities and Social Sciences offers ten bachelor's degrees (including Arts Administration, Digital Media, Elementary and Early Childhood Education, History, and Psychology), one master's degree, and one associate degree. Research centers associated with the Humanities and Social Sciences include the Center for Community Outreach, Research, and Evaluation, the Center for Manners and Civility, and the Prevention of Aggression Research Center. Ohio State University ranks #23 on The 50 Best Social Science Programs! Ohio State University was first known as the Ohio Agricultural and Mechanical College. The study of the social sciences at Ohio State can trace its history back to the founding of the school in 1870. Today the College of Arts and Sciences hosts nearly 80 majors, 38 departments and schools, and over 20 cutting-edge research centers. Departments include Arts Administration/Education and Policy, Astronomy, Chemistry and Biochemistry, Comparative Studies, Dance, French and Italian, and Molecular Genetics. Facilities include: the Aquatic Ecology lab, the Biological Sciences Greenhouses, the Center for Cognitive and Behavioral Brain Imaging, and the High Energy Density Physics - Scarlet Laser Facility. Arizona State University ranks #24 on The 50 Best Social Science Programs! Arizona State University, founded in 1885, has five campuses divided into 16 schools and colleges. ASU offers more than 800 programs from undergraduate through post-doctoral degrees for students to chose from. The Arts and Science division encompasses three branches, the College of Liberal Arts and Sciences, the New College of Interdisciplinary Arts and Sciences, and the College of Letters and Sciences. The College of Liberal Arts and Sciences has a further three divisions: Humanities, Natural Sciences, and Social Sciences. The Social Sciences division has 11 academic units including the Department of Military Science, the School of Human Evolution and Social Change, the School of Transborder Studies, and the School of Social and Family Dynamics. Centers and Institutes of research associated with the College of Liberal Arts and the Social Sciences division include the American Indian Policy Institute, the Biodiversity Knowledge Integration Center, the Center for Political Thought and Leadership, and the Center on the Future of War. University of Maryland, College Park ranks #25 on The 50 Best Social Science Programs! Founded in 1856, the University of Maryland has the distinction of being one of the largest universities in the Washington Metropolitan area. The school offers over 100 undergraduate majors, and 120 graduate programs. Its close proximity to the capital of the United States has allowed the school to maintain beneficial research partnerships with the Federal Government. The College of Behavioral and Social Sciences manages 10 interdisciplinary departments such as Criminology and Criminal Justice, Geographical Sciences, Economics, and Hearing and Speech Sciences. There are over 6,000 undergraduates and 800 graduates enrolled in the various degree tracks. Thirty five research centers and laboratories are associated with the College including the Center for Substance Abuse Research, the Psychotherapy Clinic and Research Lab, the Center for Research on Military Organization, the Center for East Asian Studies, and the Hearing and Speech Clinic. University of California, San Diego ranks #26 on The 50 Best Social Science Programs! Though relatively young for a University, being established in 1960, the University of California in San Diego saw rapid growth. There are currently over 200 undergraduate and graduate programs to select from and more than 29,000 students enrolled. The Division of Social Sciences covers 10 of the numerous departments associated with the University including Cognitive Science, Communication, Ethnic Studies, and Linguistics. There are also six interdisciplinary programs to choose from including Global Health, International Studies, and Urban Studies and Planning. The Division manages 20 research centers and laboratories. Examples of these include the Center on Global Justice, the Center for Urban Economics, the Center for Human Development, the Center for Research in Language, the Institute for Neural Computation, the Laboratory of Comparative Human Cognition, and the Institute for Brain and Mind. University of Washington ranks #27 on The 50 Best Social Science Programs! Founded in 1861, the University of Washington is well known for managing one of the most highly regarded medical schools in the world. In addition to the medical facility there are 16 other schools and colleges under the jurisdiction of the University, the College of Arts and Sciences is one of them. The College has four academic divisions: Art, Humanities, Natural Sciences, and Social Sciences. Departments include Astronomy, Classics, Dance, Drama, Economics, Germanics, Music, Philosophy, and Statistics. Research centers associated with the College include the Center for Child and Family Well-being, the Center for Human Rights, the Center for Labor Statistics, the Center for the Study of the Pacific Northwest, the European Union Center, the Middle East Center, and the Women's Center. Research topics include: Life on other Planets, Connections through Service, the Rise of Megachurches, and Understanding and Adapting to the Climate Change. Cornell University ranks #28 on The 50 Best Social Science Programs! Cornell University was founded in 1865 as a private Ivy League institution. The school has seven undergraduate colleges and seven graduate divisions. There are over 21,000 students enrolled in the various departments representing all 50 states and 122 countries. The College of Arts and Sciences has 4,000 undergraduate students and 1,200 graduate students enrolled throughout over 40 departments. Some of the programs include Classics, German Studies, the Institute for Comparative Modernities, the Program on Ethics and Public Life, Society for the Humanities, and the Medieval Studies Program. The College of Arts and Sciences manages over 100 interdisciplinary research organizations, 18 research centers, and collaborates with two national research centers. Some of the facilities include: the Animal Health Diagnostic Center, the Center for Analytic Economics, the Center for the Study of Inequality, the Community and Rural Development Institute, the Institute for Fashion and Fiber Innovation, the Cornel Population Center, and the Jewish Studies program. University of Toronto ranks #29 on The 50 Best Social Science Programs! Located in Canada, the University of Toronto was founded by royal charter in 1827 and was originally under the jurisdiction of the Church of England. The school is historically known for the discovery of insulin and the stem cell. Today there are over 47,000 students enrolled throughout the University's 13 colleges. The Faculty of Arts and Science is the main undergraduate division. The Faculty oversees a series of colleges each with a specialization in the humanities. For example, Innis College focuses on film studies and urban studies, while Woodsworth College manages industrial relations, and New College specializes in gender studies. The specific department of Social Science is organized into five broad departments, Political Science, Human Geography, Anthropology, Sociology, and Critical Development Studies. Each department further manages individual programs such as City Studies, Public Law, and Health Studies. University of British Columbia ranks #30 on The 50 Best Social Science Programs! Located in Canada, the University of British Columbia was founded in 1908. There are over 58,000 students enrolled within over 300 fields of study. The academic disciplines are organized into 18 Faculties, 12 Schools, and two Colleges. The Irving K. Barber School of Arts and Sciences is the largest division on the Okanagan campus. There are eight main units including Community/Culture and Global Studies, Psychology, Earth and Environmental Sciences, and Political Science. In total the units offer over 50 undergraduate programs and eight graduate programs. A total of 13 research groups and centers are affiliated with the School of Arts and Sciences. Some examples include the Center for the Study of Services to Children and Families, the Institute for Biodiversity/Resilience and Ecosystem Services, the Fipke Lab for Trace Element Research, and the Porter Forensic Psychology Lab. University of Southern California ranks #31 on The 50 Best Social Science Programs! Founded in 1880, the University of Southern California is the state's oldest private research institution. 42,000 students enrolled. Among other divisions, USC manages the Dornsife College of Letters, Arts, and Sciences. Students may select from nearly 80 majors, 70 minors, and 35 doctoral degree programs. There are a total of 37 departments and programs including the Narrative Studies program, the Geographic Information Science and Technology program, and the Spatial Sciences Institute. There are over 40 research centers and institutes managed by the College including the Brain Creativity Institute, the Center for Chinese Fossil Discoveries, the Center for Religion and Civic Culture, the Institute for Advanced Catholic studies, the Space Science Center, the Institute for Visual History and Education, and the Dornsife Imaging Center. Research initiatives for 2020 include Climate Change in Southern California Bight, Genocide Resistance, and Science/Technology and Society. Faculty members in the College include four Nobel Prize recipients. Washington University in St. Louis ranks #32 on The 50 Best Social Science Programs! Washington University was founded in 1853. After much growth and expansion the school now contains seven graduate and undergraduate schools and has over 14,000 students enrolled. The School of Arts and Sciences covers three generalized areas of study, the Humanities, Social Sciences, and Natural Sciences. There are 23 departments in the school including Chemistry, History, Performing Arts, and Women/Gender and Sexuality Studies. There are also 12 separate programs such as Comparative Literature, Film and Media Studies, and Urban Studies. Approximately 4,000 undergraduate and 1,800 graduate students are enrolled throughout the departments and programs. Additionally, there are eight research centers, examples include the Center for Dynamic Economics, the Center for Contemporary German Literature, the Center for the Space Sciences, and the Photosynthetic Antenna Research Center. Additional sites include the Humanities Digital Workshop, the Center on Religion and Politics, the Overseas programs, and the Tyson Research Center. University of Wisconsin - Madison ranks #33 on The 50 Best Social Science Programs! The University of Wisconsin has been established as the oldest and largest public university in the state. Academically, the institution is organized into 20 schools and colleges with over 43,000 students enrolled. College of Letters and Science remains the largest academic division at the school with approximately 22,000 undergraduate and graduate students. The College offers 70 majors, 42 certificates, and 115 graduate and professional degrees. Departments, programs, centers, and institutes include: the American Indian Studies Program, the Department of Astronomy, the Department of Botany, the Center on Child Welfare Policy and Practice, the Criminal Justice Certificate Program, the Electron Microprobe Lab, the Center for the Humanities, the Legal Studies Program, the Social Science Computing Cooperative, the School of Social Work, the Space Astronomy Laboratory, and the Center for Visual Cultures. Research initiatives include International Collaborations, Climate Change and the Environment, and Sustainability in Ageing/Health and Wellness. Vanderbilt University ranks #34 on The 50 Best Social Science Programs! Vanderbilt University is located in Nashville, Tennessee. Founded in 1873, the school now has over 12,000 students enrolled in numerous departments and programs throughout the four undergraduate schools and six graduate or professional schools. One of the busiest sections is the College of Arts and Sciences. The College of Arts and Sciences has approximately 4,200 undergraduate students enrolled. There are 22 academic departments including Art, Communication, French and Italian, Mathematics, and Theater. Additionally, there are over 20 interdisciplinary programs such as Asian Studies, Economics and History, Managerial Studies, and Public Policy Studies. The College of Arts and Sciences has 12 research centers to manage. Some examples include the Center for Integrative and Cognitive Neuroscience, the Center for Medicine/Health and Society, the Institute for Chemical Biology, and the Institute for Research on Men's Health. Indiana University ranks #35 on The 50 Best Social Science Programs! Indiana University in Bloomington has over 40,000 students enrolled within 13 academic divisions and more than 900 degree programs. The College of Arts and Sciences is the largest of the academic divisions with over 40 percent of the undergraduates in attendance. The College contains 50 departments and numerous academic programs such as African American and African Diaspora studies, Animal Behavior, Biotechnology, Computer Science, Folklore and Ethnomusicology, Interior Design, Speech and Hearing Sciences, and Zoology. There are a total of 200 research labs and facilities managed by Indiana University. Those which operate under the jurisdiction of the College of Arts and Sciences include the Center for Eighteenth-Century studies, the Center for the Study of Global Change, the Electron Microscopy Center, the Consortium for Mental Health Services Research, the Institute for the Study of Contemporary Antisemitism, and the Telecommunications Management Institute. Texas A&M University ranks #36 on The 50 Best Social Science Programs! Texas A&M is the fourth-largest university in the United States with over 64,000 students in attendance. There are over 150 courses of study organized throughout 10 colleges. Additionally, there are 18 major research institutes on campus. The College of Liberal Arts has 12 departments including subjects such as Communications, International Studies, and Psychology. There are also five major interdisciplinary programs: Africana Studies, Film Studies, Journalism Studies, Religious Studies, and Women and Gender Studies. More than 7,400 undergraduates and just over 830 graduate students are enrolled in the College. There are eight major institutes and research centers managed by the College of Liberal Arts. These include the Census Research Data Center, the Center for Maritime Archaeology and Conservation, the Center for the Study of the First Americans, the Glasscock Center for Humanities Research, the Initiative for Digital Humanities/Media and Culture, the Public Policy Research Institute, English Language Institute, and the Race and Ethnic Studies Institute. University of Amsterdam ranks #37 on The 50 Best Social Science Programs! Located in the Netherlands, the University of Amsterdam was established in 1632 and has become one of the largest institutions in Europe with an enrollment of over 31,000 students. The University is divided into seven major faculties which offer a total of 59 Bachelor degrees, 133 Master degrees, and 10 postgraduate degrees. The Faculty of Social and Behavioral Sciences has approximately 10,000 students. There are six departments: Political Science, Sociology and Anthropology, Communication Science, Psychology, Social Geography, Planning and International Development Studies, and Educational Sciences. The Faculty members have established 15 Research Priority areas as of 2008. Those areas include Brain and Cognition, Urban Studies, Communication, and Global Health. Research institutes include the Institute for Advanced Labor Studies, the Institute for Social Science Research, the School of Communications Research, the Psychology Research Institute, and the Institute of Child Development and Education. Michigan State University ranks #38 on The 50 Best Social Science Programs! Michigan State University was founded in 1855. Today the school has over 50,000 students enrolled within over 200 academic programs. The programs are organized into 17-degree-granting colleges. The College of Social Science has more than 6,300 undergraduate and graduate students enrolled in 13 major disciplines. Degree programs include Geography, Interdisciplinary Studies in Social Science, Social Work, and Urban and Regional Planning. There are specializations offered only at the graduate level which include Animal Studies: Social Science and Humanities Perspective, Food and Agriculture Standards, Infancy and Early Childhood, and Judicial Administration. The College of Social Science manages a number of research centers and institutes such as the Center for Anti-Counterfeiting and Product Protection, the Center for Global Change and Earth Observations, the Institute of Public Utilities, and the Center for Humane Arts, Letters, and Social Sciences Online. University of Illinois at Urbana-Champaign ranks #39 on The 50 Best Social Science Programs! Established in 1867, the University of Illinois is the second oldest public institution in the state. The school is comprised of 17 colleges which offer the 44,000 enrolled students over 150 programs to choose from. The vast alumni body has 159,000 members and includes eight Nobel Laureates and six Pulitzer Prize recipients. One of the 17 colleges on campus is the College of Liberal Arts and Sciences. This college is organized into 60 academic units. Departments include subjects such as Language and Culture, Chemical Sciences, International and Area Studies, and Social/Behavioral Sciences. Within the Social/Behavioral Sciences unit there are further divisions such as the Neuroscience Program, Latino/Latina Studies, and the Cline Center for Democracy. Research collaborations exist both within the school and externally in almost 60 countries worldwide. Some examples include the Lemann Institute of Brazilian Studies, the U of I Singapore Collaboration, and the Illinois-Sweden Program for Educational and Research Exchange. University College London ranks #40 on The 50 Best Social Science Programs! A public research university in London, England, University College London was established in 1826. There are over 35,000 students enrolled and over 6,000 academic and research faculty members. The vast alumni network includes 29 recipients of the Nobel Prize, the most recent of whom was John O'Keefe in 2014. Famous alumni names include Mahatma Gandhi, Alexander Graham Bell, and Peter Higgs. The Faculty of Social and Historical Sciences manages eight departments including: Archeology, History of Art, and Political Science. There are also over 25 centers and institutes of research under the jurisdiction of the Faculty. Some of those centers include the Center for Digital Anthropology, the Center for the Research and Analysis of Migration, the Center for Transnational History, the Center for Museums, Heritage, and Materials Culture Studies, the Costal and Estuarine Research Center, the Urban Lab, and the Center for Terrestrial Carbon Dynamics. Dartmouth College ranks #41 on The 50 Best Social Science Programs! Dartmouth College was established in 1769 as a private Ivy League research institution in Hanover, New Hampshire. It is recognized as the smallest of the Ivy League's with just over 6,000 enrolled students. The academic divisions consist of three major schools and the Liberal Arts College. The Faculty of Arts and Sciences manages 40 departments and interdisciplinary programs. There are four major areas covered by the department: the Arts and Humanities, Interdisciplinary Programs, the Sciences, and the Social Sciences. The Social Sciences division has eight generalized departments including: Education, Government, and Psychological and Brain Sciences. Dartmouth College has over 50 research-focused centers, institutes, and groups. Academic Centers managed by the Division include: the Bergman Electro-acoustical Music Studio, the Dartmouth Brain Imaging Center, the Language Resource Center, and the Nelson A. Rockefeller Center for the Social Sciences. University of Warwick ranks #42 on The 50 Best Social Science Programs! The University of Warwick is a public research institution for higher education located in Coventry, England. Established in 1965, the school is organized into four faculties of Arts, Medicine, Science, and Social Sciences which operate 32 departments. The Faculty of Social Sciences encompasses the School of Law and the Warwick Business School. Departments include the subjects of Politics and International Studies, Philosophy, Sociology, and Economics. Academic centers include the Center for Applied Linguistics, the Center for Educational studies, and the Institute for Employment Research. The Faculty of Social Sciences members participate in three cross-faculty centers: the Center for Interdisciplinary Methodologies, the Center for Lifelong Learning, and the Warwick Q-Step. Other collaborative and affiliated research centers include the Center for Criminal Justice, the Center for Human Rights in Practice, the Center for Rights/Equality and Diversity, the Center for Comparative Labor studies, the Economics Research Institute, and the Social Theory Center. VU University Amsterdam ranks #43 on The 50 Best Social Science Programs! Vrije Universiteit, or VU University Amsterdam originated in 1880. More so than most schools, VU was created in order to advance a particular social vision. University president and later Netherlands Prime Minister envisioned a society with separate social spheres ranging from the family, to business, to government, all functioning harmoniously and efficiently. Now his vision has turned into 23,000 students all advancing knowledge in one of Europe's leading research centers. Faculties of the school include Behavioral and Movement Sciences, Dentistry, Earth and Life Sciences, Economics and Business Administration, Humanities, Law, Sciences, Social Sciences, Theology, and the VUmc School of Medical Sciences. The Faculty of Social Science was formally established in 1963. It consists of six departments: Communication Sciences, Organizational Science, Philanthropic Science, Political Science and Public Administration, Social and Cultural Anthropology, and Sociology. Nearly 3,000 students, both undergraduate and graduate level, were enrolled in the Social Sciences in 2015-2016 school year. Erasmus University ranks #44 on The 50 Best Social Science Programs! Erasmus University is a public institution for higher education located in Rotterdam, Netherlands. Founded in 1913, the academic departments are organized into seven faculties and four generalized areas of expertise: Health, Wealth, Governance, and Culture. Under the expertise of Culture are the Erasmus School of History, the study of Culture and Communication, the Faculty of Philosophy, and the Faculty of Social Science. The Faculty of Social Sciences covers six major divisions: Public Administration, Pedagogical Sciences, Psychology, Sociology, the University College of Liberal Arts and Sciences, and the Erasmus Graduate School. Research groups affiliated with the various departments under the Faculty of Social Sciences include the Comparative Public Services Innovation group, the Cognitive Aspects of Psychopathology program, and the Culture and Meaning in Contemporary Modernity group. University of California, Irvine ranks #45 on The 50 Best Social Science Programs! The UC campus at Irvine is one of 10 general campuses in the University of California system. There are 80 undergraduate degrees and 98 graduate and professional degrees for the 30,000 enrolled students to select from. The School of Social Sciences is the largest academic unit on campus with over 5,000 students in attendance. The school is organized into seven departments: Anthropology, Chicano/Latino Studies, Cognitive Sciences, Economics, Logic and Philosophy of Science, Political Science, and Sociology. Research centers, institutes, and facilities managed by the school include: the Center for Citizen Peacebuilding, the Center for Ethnography, the Center for Language Science, the Center for the Study of Democracy, the Institute for Mathematical Behavioral Sciences, and the UCI Interdisciplinary Center for the Scientific Study of Ethics and Morality. Affiliated Centers and Facilities include the Center for Hearing Research, the Experimental Social Science Laboratory, and the Human Subjects Laboratory. George Mason University ranks #46 on The 50 Best Social Science Programs! George Mason University has been recognized as the largest public research university in the commonwealth of Virginia. Originally founded as a branch of the University of Virginia, the school became an independent institution in 1972. There are 81 undergraduate degrees and 88 master's degrees for students to select from. One of the various academic divisions includes the College of Humanities and Social Sciences. The college is composed of 10 departments and 11 major interdisciplinary programs. Studies include fields such as African and African American Studies, Higher Education, Modern and Classical Languages, Religious Studies, and Women and Gender Studies. Research centers include the Center for Advancing Correctional Excellence, the Center for Climate Change Communication, the Center for History and New Media, the Institute for Philosophy and Public Policy, and the Korean Studies Center. University of Arizona ranks #47 on The 50 Best Social Science Programs! Founded in 1885, the University of Arizona is well known for the operation of a separate four year MD college. In addition there are over 300 fields of study for undergraduate and graduate students. The academic divisions are organized into 20 colleges and 11 schools over three campuses. The College of Letters, Arts, and Science is included in the 20 academic divisions. The school features the College of Social and Behaviors Sciences which offers 20 disciplinary, multidisciplinary, and research units. Some of the departments include Aerospace and Mechanical Engineering, Animal Science, Cancer Biology, Disability and Psychoeducational Studies, Entomology, Nutritional Science, and Remote Sensing and Spatial Analysis. Research centers include the Arid Lands Information Center, the Center on Ageing, the Research Institute for Solar Energy, the Poison and Drug Information Center, the Respiratory Center, and the Water Resources Research Center. Johns Hopkins University ranks #48 on The 50 Best Social Science Programs! Founded in 1876, John Hopkins University has established itself as a private research institution with 10 major academic divisions. This includes the Krieger School of Arts and Sciences which maintains three main areas of study, Humanities, Natural Sciences, and Social Sciences. There are 22 departments including Biophysics, Cognitive Science, Earth and Planetary Sciences, History of Science and Technology, and Near Eastern Studies. The various departments offer a total of 60 undergraduate majors and minors, 40 full-time graduate programs, and over 20 part-time graduate programs. The Social Science division in particular covers three departments, Economics, Political Science, and Sociology; two programs in Public Health Studies and Social Policy; and one Center for Financial Economics. Other affiliated research centers and institutes with the Krieger School include the Center for Government Excellence, the Institute for Quantum Matter, the Mind/Brain Institute, the Population Center, and the Racism/Immigration and Citizenship Program. The University of Melbourne ranks #49 on The 50 Best Social Science Programs! Founded in 1853, the University of Melbourne is an Australian public research institution of higher education. It is also Australia's second oldest University. The school consists of 12 residential colleges and 11 academic units. Numbered amongst the educational divisions is the School of Social and Political Sciences which includes five major divisions: Anthropology and Development, Criminology, Gender Studies, Political Science, and Sociology/Social Policy and Social Theory. A long standing research partnership has been maintained between the School of Social and Political Sciences and the Brotherhood of Saint Lawrence. The goal of the Brotherhood has been to reduce poverty levels in Australia. A result of this partnership has been a number of research council initiatives such as Challenging and Preventing Workforce Vulnerabilities in Midlife and Beyond, Cognitive Decline Partnership Center, and Poverty, Family Chronic-Stress, and Children's Development. The University of Manchester ranks #50 on The 50 Best Social Science Programs! The University is a public research institution of higher education located in Manchester, England. The current version of the school was formed in 2004 with the merger of the University of Manchester Institute of Science and Technology with the Victoria University of Manchester. The School of Social Sciences has about 3,000 undergraduates and 300 graduates enrolled within six major subject divisions: Economics, Philosophy, Politics, Social Anthropology, Social Statistics, and Sociology. There are four major research centers operated by the School of Social Sciences: the Cathie Marsh Institute for Social Research, the Center on Dynamics of Ethnicity, the Sustainable Consumption Institute, and the Manchester Institute for Collaborative Research on Ageing. National collaborations exist with ESRC's British Election Study, the UK Data Service, the Administrative Data Service, and the National Center for Research Methods.